We, a collective of African activists from 11 countries across the continent, came together in Arusha, Tanzania to deliberate, mobilize and build solidarity for the democratic struggle of the Togolese people against the neocolonial, dynastic dictatorship of Faure Gnassingbe. A brutal dynasty that is in its 51st year of the usurpation of the power of the Togolese people. This week the people of Togo rose up like they have risen for many years against a system of oppression and injustice. Currently, six people have lost their lives including an eleven-year-old child. This has been the reality of our sisters and brothers in Togo; a people who are demanding nothing but the end of the dictatorship are now being killed, tortured and jailed with impunity. The struggle in Togo, we recognized, is a demand history has always entrusted the masses to amplify in every time and place. That democracy and the will of the people must eventually triumph and unseat the unjust powers that be. 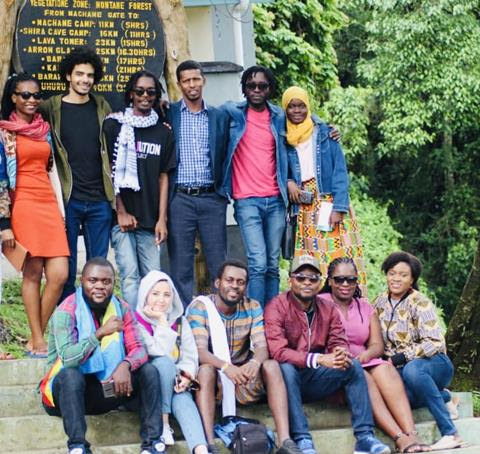 It is in this spirit that we, a collection of young Africans, have converged from far and wide to support and honor this most unique and historical struggle. The people who were and continue to be murdered by the heartless regime of Faure Gnassingbe will not be unaccounted for, it will not be another statistic to be counted and erased. They will be symbols for the resistance, they shall be names, bodies and souls that will haunt the regime; for we will keep naming them and we will keep their spirits alive. Most of all they will continue to inspire the most powerful of resistance against Faure Gnassingbe and his cronies. We call on the comrades, sisters, brothers, mothers, and fathers in the dignified country of Togo to keep the spirit of defiance alive for we can only get the oppressor off our backs when we stand up hand in hand. We affirm the righteousness of your struggle, your consistency, and your colorful spirit even in the bleakest of times. Our solidarity with you today is inspired by your solidarity with us. We have seen how even as you go through your own hard and relentless struggle, you have stood continually with the struggling masse of the African people. We salute your courage and your pan-Africanist spirit wherever on the continent we might be. We assure you that the anti-dictator winds that are blowing across the continent are coming powerfully loaded with the cries, history and union of the masses and will lead us all to witness the humiliating fall of Faure Gnassingbe like many others before him. Rest assured that he will become another Compaore, Mubarak, Ben Ali, Mugabe and Jammeh. This is the inevitable verdict of history and like a Tsunami, it will meet the dynasty unaware. Lastly, we offer you our countries as organizing and living spaces if you ever want a safe refuge to dwell in and strengthen your movement. We stand with you unconditionally today and forever! Long live the fighting spirit of the Togolese people! Long live the spirit of Pan African solidarity! Until victory, onwards! Aluta Continua!